Aeium Limited provides unique and captivating ways of displaying ideas and images to clients and customers. The Video Book is a slim screen housed in a book, brochure or card giving the opportunity to display your unique marketing message to the recipient without the need to use a pc or hand held device. When delivered to the right person the Video Book gives your message real impact. The Photo Book is an outstanding consumer product with unique business applications. An upmarket pitch, a commemorative book or a handbook for high end equipment, all look enhanced when bound in a soft or hard case book. Cover materials can be simple laminated paper or expensive leather and other speciality materials. Digital print is the base from which we work. Simple products such as business cards, postcards, greetings cards, stationery, posters, brochures and banners are the norm but how about a promotional advent style calendar to help target an advertising campaign? Or a free standing display incorporating a written message or video screen? Let us turn your ideas into physical form. Aeium Limited is a Somerset based marketing media company. We offer a wide range of products and services to our customers who include blue chip organisations and small enterprises. 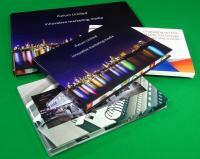 Specialising in Video Books and Photo Books we offer innovative marketing collateral. © Copyright 2013 by aeium. All rights reserved.